I find it fascinating to track down the locations of the photos my father took in the late 1940s. They all tell a story and highlight the changes that have taken place across London over the last 70 years. Sometimes, I can put a pair of photos together that sum up the change, not just at that specific place, but across a whole area of London, and that is the case with today’s post -The Gun Tavern – A Tale Of Two Wappings (with apologies to Charles Dickens). 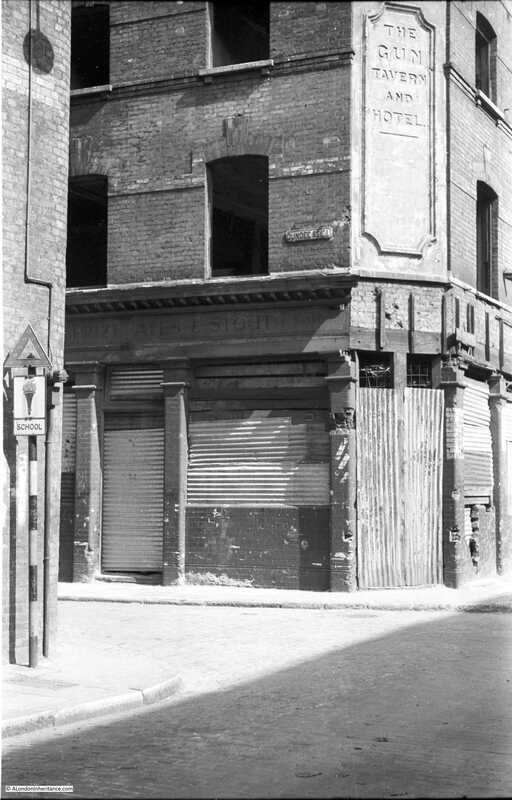 The Gun Tavern and Hotel was on the corner of Wapping High Street and Dundee Street. Wapping is the area to the east of the Tower of London. An area of high density housing, warehouses and docks. 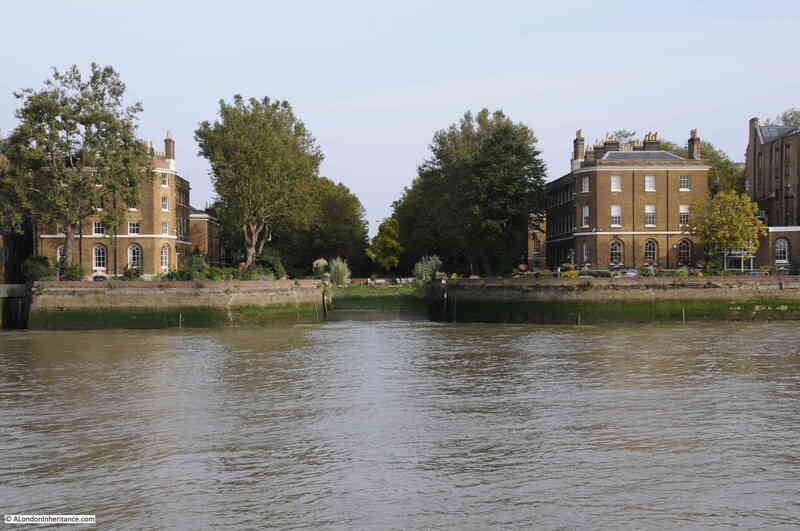 Nearly all activity that took place in Wapping was driven by the River Thames. Ships moored alongside the warehouses or lighters transported goods to and from ships in the river. Steps leading down to the river provided access for those who worked out on the river. Housing provided very basic accommodation for the workers and the many pubs provided almost the only escape from work. I will not put any text in between the following two photos so they can be compared. The first is the original photo taken by my father of the Gun Tavern and Hotel. I easily found the location today and the second photo shows the same scene today. Look at the building on the left which is the same in both photos. The pattern of the brickwork is the same and in the lower left of both photos, set into the pavement is a fire hydrant in the same position over 69 years. The major change is the building that now occupies the site of the Gun Tavern. 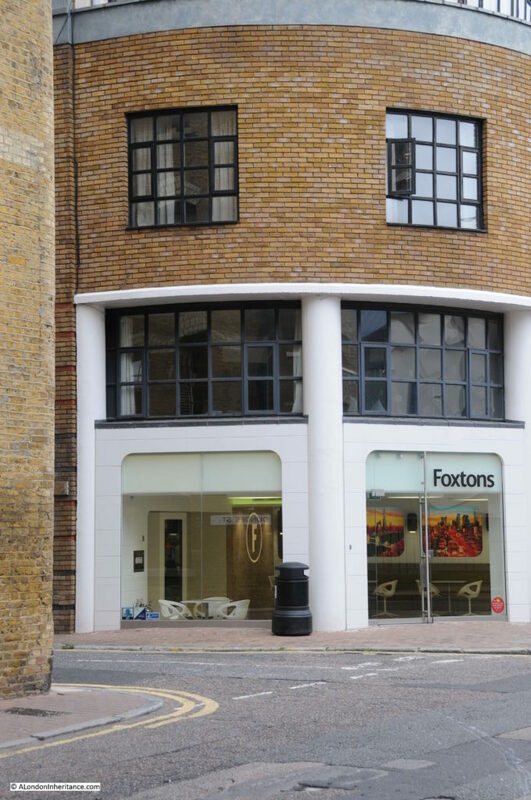 This is now a Foxtons Estate Agents and these two photos sum up the changes to Wapping over the past 70 years. Walk along Wapping High Street and the majority of the old warehouses and wharf buildings have now been converted to apartment buildings, forming a barrier between the river and the street. There are some access areas and walkways, however considering how close this is to central London, Wapping High Street feels strangely quiet. It is almost a dormitory street for those who work in the rest of London, or apartments that get occasional visits from their remote owners. It has to be a wasted opportunity as with a more mixed use approach and more affordable housing this could be a much more vibrant area. Wapping High Street is one of the few streets in London where you can walk a distance and not find the usual Starbucks, Costa or Pret which I assume the lack of local business or passing trade cannot justify. I last walked along Wapping High Street a few years ago and the site of the Gun Tavern was then a cafe, however either it could not make enough money, or the new development now occupied by Foxtons was a more profitable change for the owners. 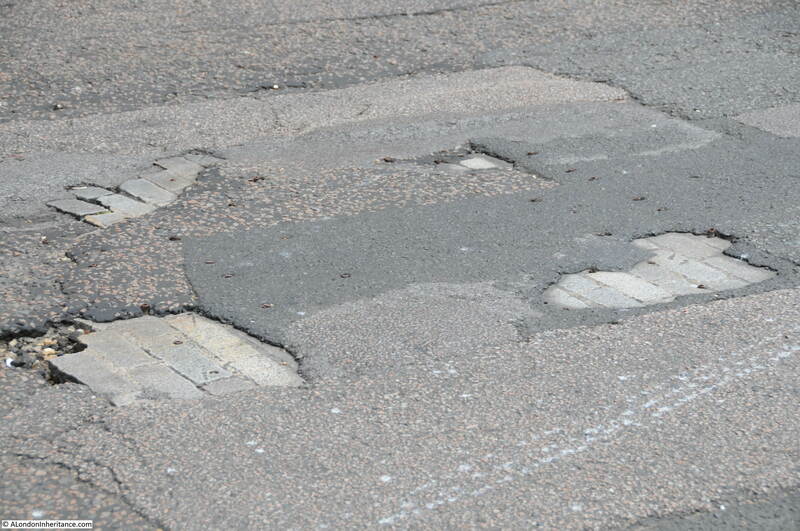 The same road surface as in my father’s photo showing underneath later surfacing. The map below is an extract from the 1893-1895 series Ordnance Survey map. This shows the area around Dundee Street and the Gun Tavern including some of the many street name changes. 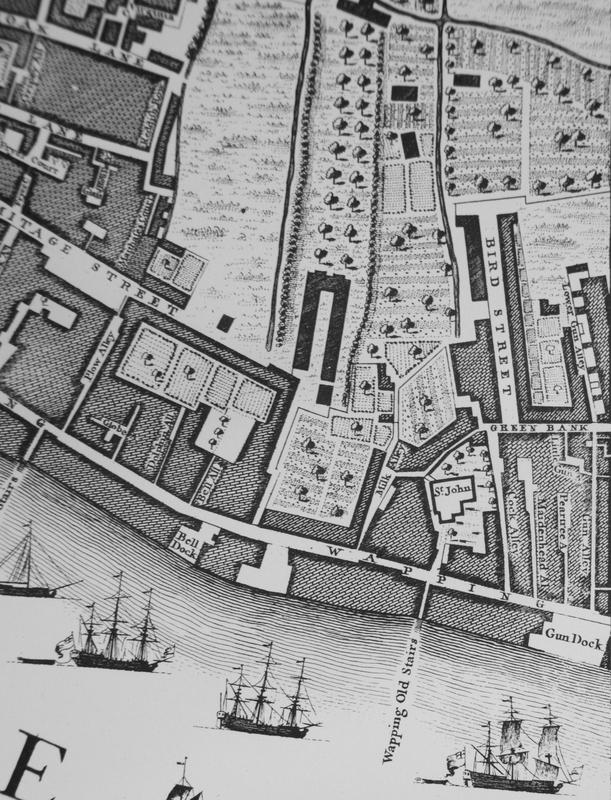 The River Thames is at the bottom of the map, and Wapping High Street is running left to right across the map. At the time of this map, Dundee Street was called Upper Well Alley and can be seen running vertically from Wapping High Street just to the right of centre. The Gun Tavern is the building labelled PH at the junction of Upper Well Alley with Wapping High Street. The considerable number of pubs across Wapping can be seen just by the sample in this one small area. 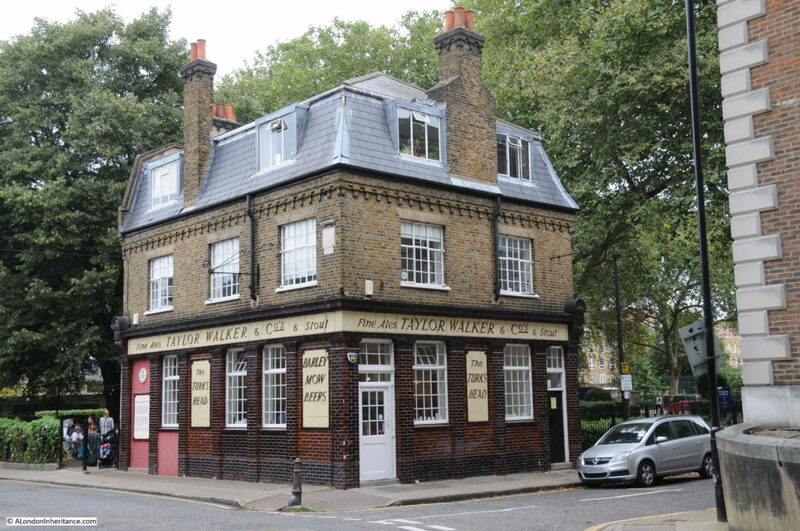 Including the Gun Tavern, there are seven Public Houses marked. Today, there are hardly any pubs across the whole of Wapping. The only inland pub is Turner’s Old Star on Watts Street. The other pubs are the riverside pubs, Town of Ramsgate, The Captain Kidd and The Prospect of Whitby. The Town of Ramsgate is shown in the above map as the PH just above Wapping Old Stairs. At the end of the 19th century, there were roughly 29 public houses along just Wapping High Street. I have been unable to trace when Upper Well Alley changed named to Dundee Street. At the end of Upper Well Alley in the above map, facing on to the river is New Dundee Wharf, so the new name must have come from the name of the Wharf and as it has “New” at the start of the wharf the name of the wharf must have been relatively recent. In the 19th century, the Gun Tavern was often used as a location in which to hold an inquest. Reading accounts of these from newspapers of the time provides a fascinating insight into life in Wapping and London. “At a late hour last evening Mr. Baker held an inquest at the Gun Tavern, Gun Wharf, Wapping on the body of Mrs. Lucy Robinson, alias Hawker aged 36 years, who was found drowned. William Adamson, a fisherman, said that on Tuesday forenoon, whilst in his boat, grappling off Wapping in sixteen feet of water, his grappling iron brought up the body of the deceased. She had a long Cashmere scarf twisted tightly around her waist, and her bonnet strings were tied in nine knots close under the chin. Mr. Henry Lambert, proprietor of the Caledonian Arms, Pentonville, identified the body as that of his sister; she some months kept the Vine Tavern, Kentish Town; she was then a widow. A man named William Hawker, an omnibus conductor, used to frequent the house. He soon after professed an attachment to her; he represented himself as a single man; the correspondence was carried on for some time, and he ultimately induced her to cohabit with him as man and wife. Witness, hearing of this fact went to her, for the purpose of expostulating with her on her conduct, when words ensued between Hawker and witness. Hawker struck him several violent blows, and knocked him down, the next day witness went to the house again, his intention being to get a warrant for the assault. when he went he found the house shut up, and that Hawker and deceased had gone to France; they soon after returned, when he heard they had been married and that Hawker had drawn about 900s of deceased’s money, from a bank in which she had deposited it. He had never seen her since. Martha Gaylor of Vine-cottage, Kentish-town, deposed that she had been a tenant of the deceased’s, and on terms of intimacy for the last eight years. After deceased and Hawker came from France, they went to live at No. 11 Marylebone Street. She told witness she was married; and that since she had found out that he had a wife living. Witness knew that there was a woman called Mrs. Hawker, and had seen her call at the house since Hawker’s return from France. Deceased had often complained to witness of the ill-usage she received at the hands of Hawker, showing bruises on her wrists, face and other parts of her person; and that he was in the constant habit of drinking, and ill-using her since she had obtained her money. On Tuesday week he thrust her out of doors violently on to the pavement. She took drink occasionally. Reading the newspaper accounts of the numerous inquests held at the Gun Tavern covering suicides, murders and accidents quickly dispels any romantic view of life in Wapping by the River Thames in the 19th century. Another newspaper article from the 18th December 1894 had the title “Not sober for 4 years” and told the story of the death of a woman from number 8 Upper Well Alley, Wapping who had not been sober for over 4 years. The wife of a waterside labourer, she would not get up until 4 in the afternoon and had already taken everything in the house to the pawn shop to fund her drinking. When she could no longer move, she managed to get rum brought to her bed and after her death a bottle of spirits were found hidden underneath the pillow. Upper Well Alley, or Dundee Street of today is very different to the days of the 19th century newspaper reports and is under going further change. The photo below taken in Dundee Street shows the St. Patrick’s Social Club building which I believe will soon be demolished. Dundee Street and along Green Bank was once home to St. Patrick’s Social Club, School and Church. Today only the church remains. On the corner of Dundee Street and Green Bank is an old bollard dated 1899 and stating Limehouse District. 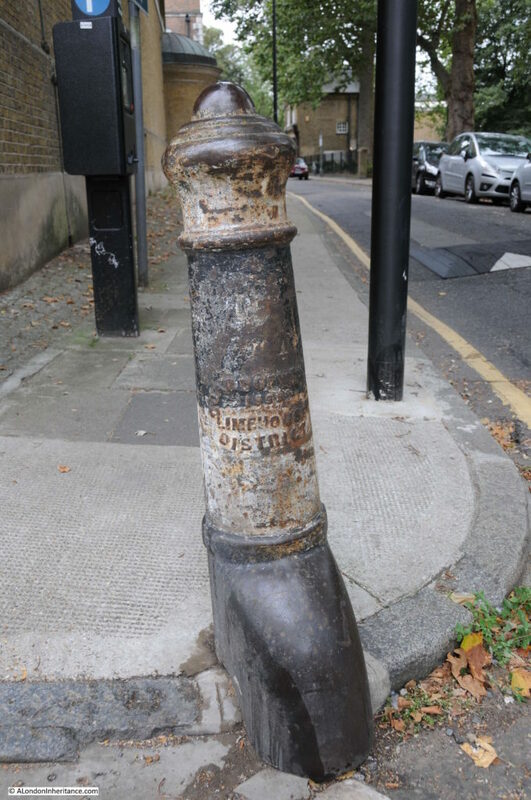 In the late 19th century, the district of Limehouse extended from the main land area around St. Annes Limehouse, along a narrow strip of river side land in Wapping to a short extension inland here around Dundee Street. This bollard was the only remaining marker I could find around Dundee Street, Green Bank and Scandreet Street. Looking down Dundee Street, or as it was Upper Well Alley, from the junction with Green Bank. 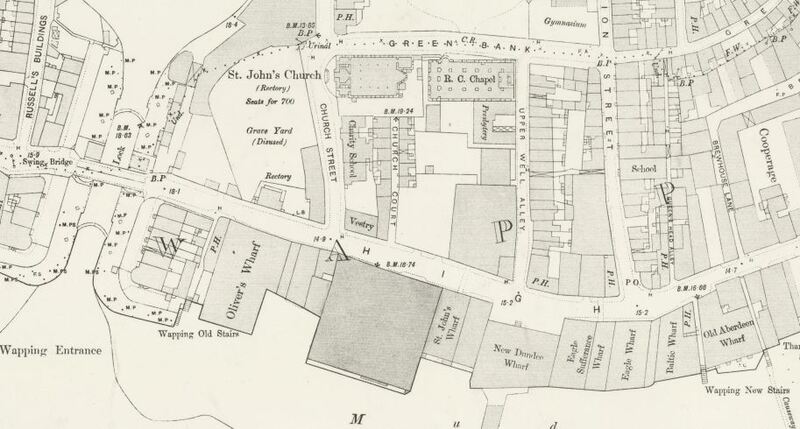 At the end of Green Bank, on the corner with Scandrett Street (or Church Street as it was on the 1895 Ordnance Survey map) is the old Turks Head pub (the PH at the very top, centre of the above map). Closed as a pub in the late 1970s, the Turks Head was restored by a charitable trust in the 1980s providing a community cafe for the local area. 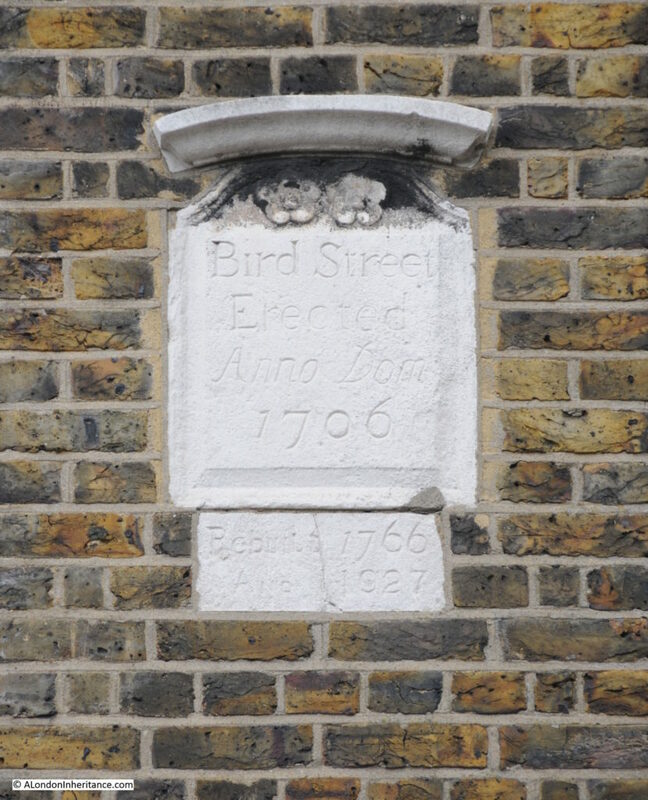 On the Scandrett Street side of the building is the original 1706 street name plaque, confirming that this was originally Bird Street. The following extract from John Rocque’s map of 1746 shows the area in the right hand lower quarter. Bird Street is clearly marked as is Green Bank (about the only street in the area to retain its original name). Comparing with the 1895 Ordnance Survey map shows that New Dundee Wharf was originally Gun Dock and leading north from here was Gun Alley and across Green Bank Lower Gun Alley. This explains where the name Gun Tavern came from although whether the street or the pub was named first is a good question. What appears to have happened over the last almost three hundred years is that Gun Alley was probably the original name, following by Upper Well Alley and then Dundee Street which remains the name today. Fascinating why names change so much and in this small area of Wapping only Green Bank retains its original name. (It is tempting to think that as Green Bank dates from at least 1746, the name may refer to an embankment along here that held the river back from further encroachment inland, much like the original street name of Narrow Wall on the South Bank, although I have not found any proof of this). 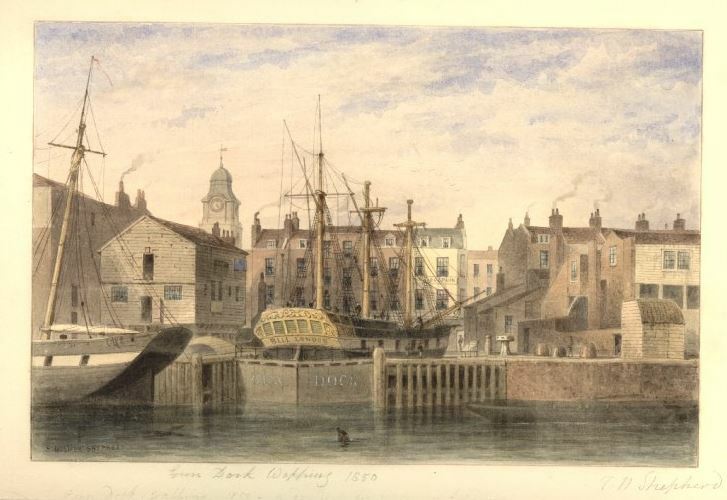 the following print (©Trustees of the British Museum) shows the view of Gun Dock from the river in 1850. The church tower in the background is that of St. John’s which we will come to next. 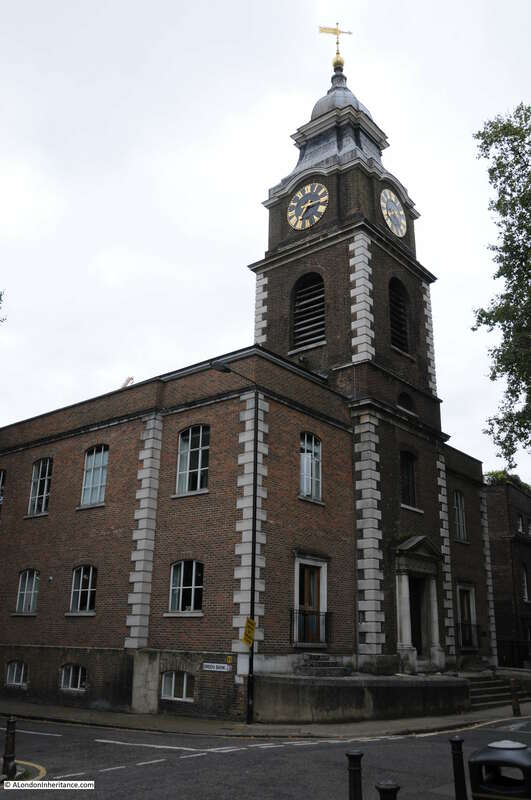 The original 1756 parish church of St. John’s is on the corner of Green Bank and Scandrett Street. The church was badly damaged during the war with only the tower and the shell of the rest of the church remaining. The building was later rebuilt as apartments so apart from the tower, the rest of the building is a new construction. To blend in with the surroundings much of the external walls were built using materials from other buildings destroyed during the war. Next to the church are the buildings of the St. John’s School. 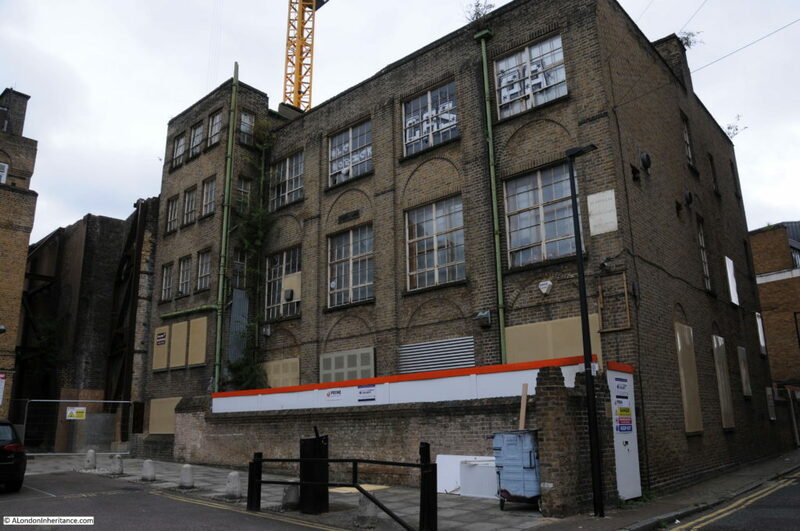 Although founded in 1695, the school was established by voluntary subscriptions in 1704, with old buildings on the west side of church street purchased to provide accommodation for the school. 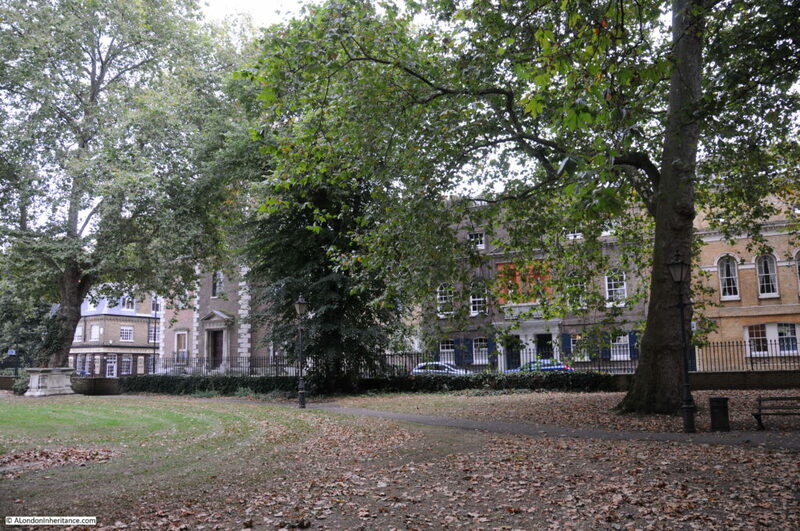 The site of these original buildings were included in a later expansion of the churchyard, so in exchange, a plot of land was given to the trustees of the school and the buildings that we see now constructed in 1756 to 60. The school appears to have been in a reasonably financially stable position. The 1819 the second report by the Commissioners on the Education of the Poor reported that the school held £2,000 in stocks and the dividends from these, as well as an annual £10 rent from the lease of a small parcel of land provided much of the income that the school needed. 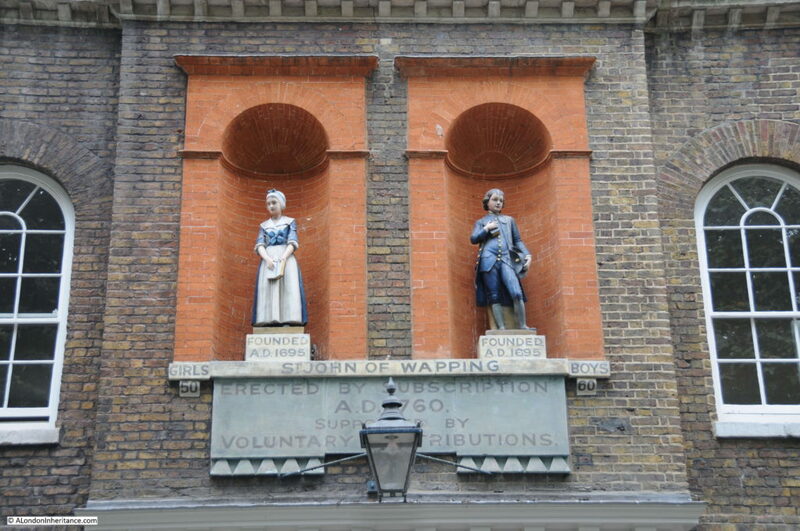 There was also a separate fund of £384 which had been raised by subscription among the inhabitants of Wapping in 1725. This money was used to purchase some land and buildings and at the time of the report a rent of £60 10 shillings was being generated for the school. This was in excess of the dividends and money from rents received by the school, with the gap being made up from voluntary subscriptions. Above the doors to the school, statues of school children in their blue coat uniforms. Opposite the church and the school is the original churchyard. 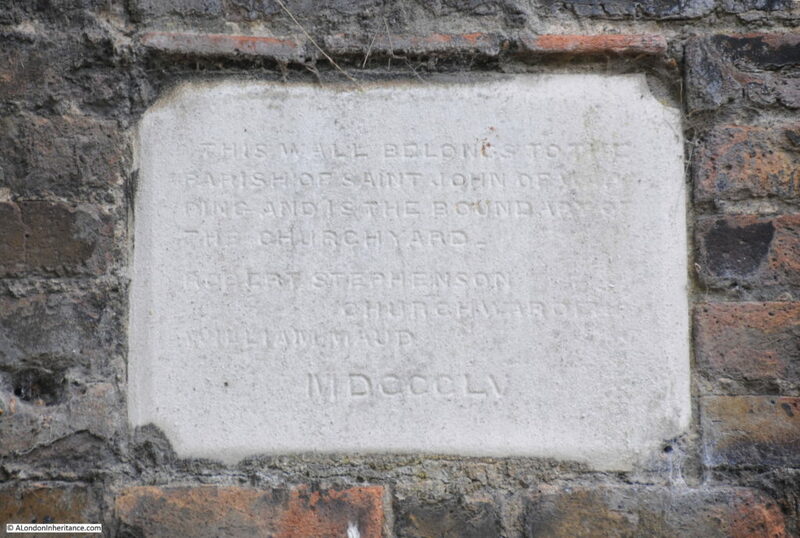 A plaque set into the wall of the churchyard, dated 1855 states that the wall belongs to the Parish of St. John of Wapping and is the boundary of the churchyard. 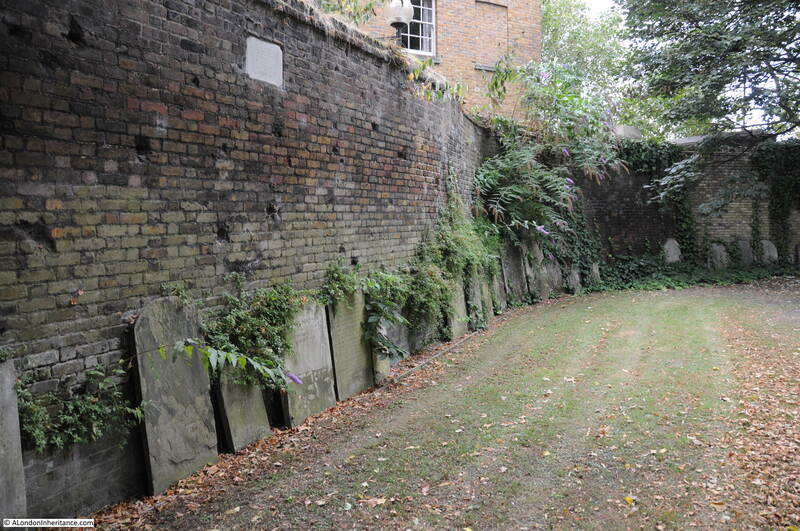 The churchyard wall, plaque and old headstones lined up against the wall. 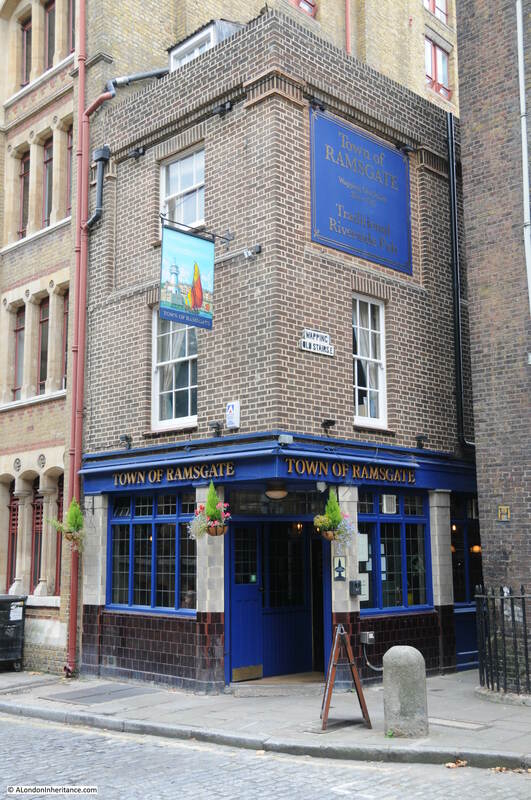 One of the few remaining pubs in Wapping is the Town of Ramsgate – a pub which deserves a dedicated post. The pubs on the river almost certainly have a long-term future, their river facing location provide a reliable stream of custom which ensures their profitability and the history of pubs such as the Town of Ramsgate and the Prospect of Whitby should also hopefully also protect their future. The entrance to Wapping Old Stairs is down the alley to the right of the pub. If you walk a very short distance back along Wapping High Street towards the City, you cross the old entrance to the Wapping Basin and the London Docks. 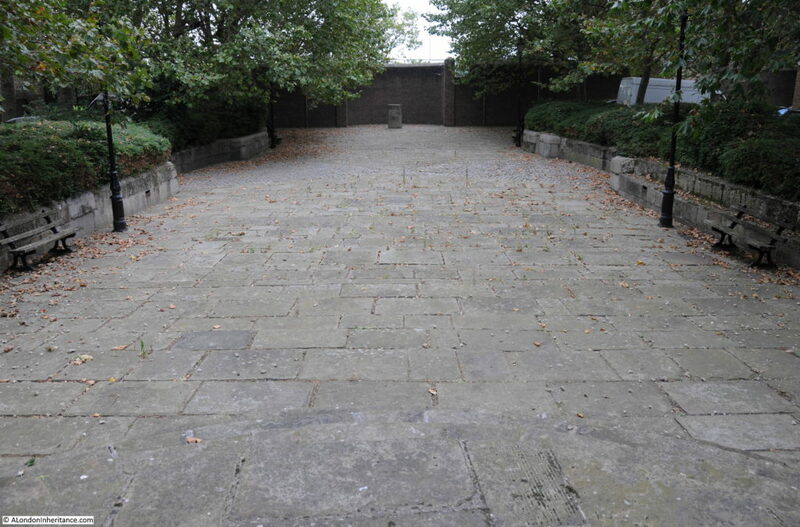 This has long been filled in following the closure of the docks, however stand on the Wapping High Street and look in land and the entrance to the Wapping basin is still visible with the walls of the entrance channel still either side of what is now a paved area. The buildings on the western side of Pier Head. The original buildings from when this was a working dock line the entrance at Pier Head either side of Wapping High Street. The following photo is looking back towards Dundee Street from Pier Head. This was originally a swing bridge allowing the channel to be opened up whenever a ship needed to cross between the river and the Wapping Basin. This must have been really impressive to watch. When I travelled down the Thames last October I took the following photo from the river showing the entrance to the Wapping basin and the buildings of Pier Head on either side. Leaving Pier Head, i headed back to central London down a relatively quiet Wapping High Street until reaching the bustle of St. Katherine’s Docks which, on a busy Friday lunchtime was crowded with people. The area around Dundee Street has so much history. 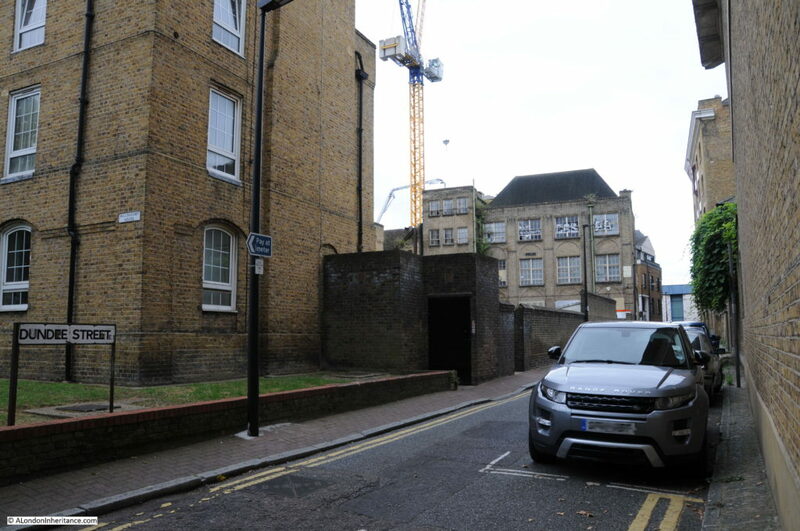 I have not even touched on the River Police, or the stories associated with Execution Dock, but the area runs the risk of being turned into a quiet suburb of silent apartments lining Wapping High Street. This will be such a loss. This entry was posted in London Pubs and tagged The Gun Tavern, Wapping, Wapping High Street on September 11, 2016 by admin. Thought you might enjoy it! Agree with last comment about being back in London. I find out so much about the capital from your postings. So detailed. Did your father ever photograph Blackfriars Road? My friend has lived in the area all his life and would be interested to see some old views of it. Although I worked in Edinburgh for a while and lived next to the Forth Bridge at South Queensferry, I too am pleased to welcome you back to London with your fascinating insight into Wapping’s history. Thanks for a vey interesting post and all your research. Fascinating post. I wandered around this area only a month or so ago (visiting the church and looking at the old school, etc. ), so very interesting to read so much more background detail and to see the old maps. Re: Green Bank and Narrow Wall (on the South Bank), is this perhaps the same reason as to why Narrow Street is named as such in Limehouse? My Grandfather owned The Gun Tavern up until it was badly damaged between the 8th and 10th September 1940. I have a few stories and other information on the pub, but yours is one of the earliest photos that I have seen. The family photos etc were destroyed in the fire that resulted from the bomb damage. what would “affordable housing” whatever that is, do to turn the area a bustling high-street? Don’t people who live in such properties work on a Friday, which was when you visited. The issue is more how its been redeveloped, with the river generally cut-off, as you observed. Just found your site. Thank you. My ancestors were born in Lower Gun Alley in the late 1800`s. They were Thames Lightermen or worked on the docks. One side of the family came from Dundee in the 1850`s !! My grandfather Arthur Lucy was born in 41 Lower Gun Alley on 21st May 1880 his father was John Lucy and mother maiden name Sarah Harrington who lived in Hermatige street. Very interesting article! 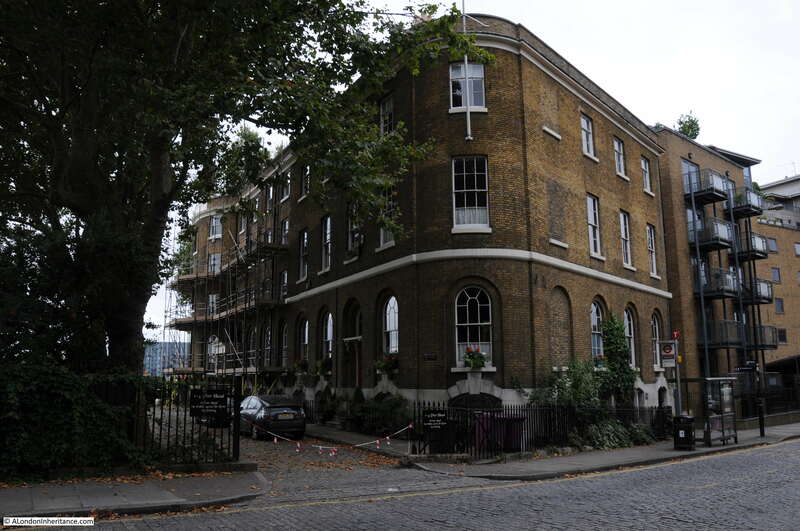 Three generations of my family lived in Wapping circa 1820 – 1900. 3 x great grandfather was a sawyer, 2x great grandfather a shipwright, and my great grandfather joined the navy in 1862, just before his 15th birthday. He jumped ship in Sydney on 1870, and was never apprehended even though there as a £3 reward on his head! Addresses back then were in those many alleys…. Lower Gun Alley, Upper Well Alley, Star Alley, Anchor and Hope Alley, Milk Alley (Ratcliffe). Although probably as poor as church mice it seems they could read and write. My great grandfather and his father both signed the navy enlistment papers in beautiful handwriting! Your article and photos brought back my memorable day in Wapping 10 years ago…something of a pub crawl from st George in the East to Turners Old Star (orange juice), Town of Ramsgate (lunch), then Prospect of Whitby ( cup of tea)! My distant English cousin, whom I had just met, had old maps for the area so we had lots of fun locating the spots where those old alleys were, not so easy when, as you commented, so many streets have completely disappeared or had a name change. Corrections to the email above! Salters Alley, not Star Alley! Milk Yard, not Milk Alley, which was to the east of Wapping, not so far from the Prospect of Whitby and Shadwell Basin. The alleys in Wapping where my ancestors resided were those that ran between Tench St and Greenbank. That area is now Wapping Park. I read that the original slums were demolished circa 1880- 1900. Am I right in assuming that they were replaced with housing which was probably bombed during the Second World War after which the park was created? This may account for the fact that my family seem to have moved slightly east, last known addresses being Collingwood Rd, Ratcliffe and Juniper St, Shadwell. I often wonder which school in Wapping he attended? Was it the one at St John’s or the one in Raine St or???? I also wonder what my forebears would have made of the gentrification of Wapping! Penthouses worth more than one million pounds! The 1:2500 Ordnance Survey map of 1872 shows densely-packed housing between Tench Street and Green Bank: https://maps.nls.uk/view/103313048. It includes Salters Alley. 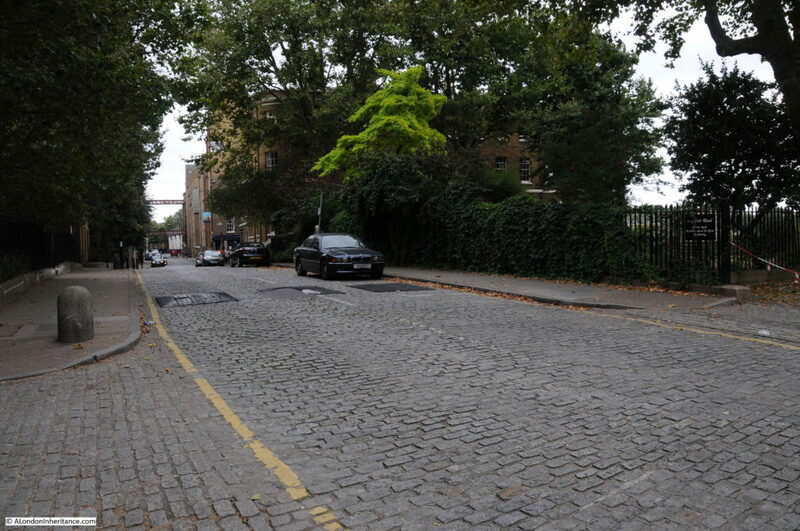 By the time of the 1893-4 revision most of that housing, including Salters Alley, had been replaced by Wapping Recreation Ground: https://maps.nls.uk/view/101919834. Thank you, Malcolm, for the maps which clearly depict what happened to all those alleys. Interesting to see how streets were continually being renamed. Red Lion St in the 1890’s encompassed the original section closer to the Thames, the middle section (formerly Anchor and Hope Alley, now Reardon Path) and Broad St ( now Reardon St). I was particularly interested to see that Raine St was formerly Charles St. 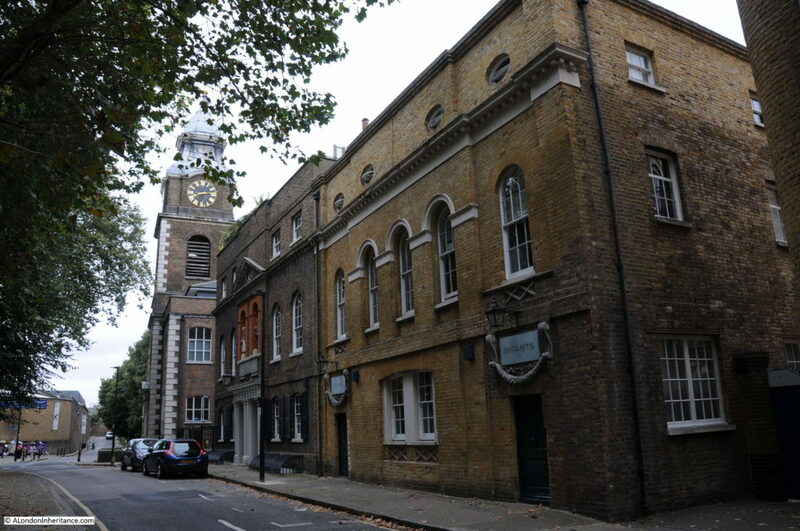 When my gggrandfather married at Christ Church Shadwell in 1847 he lived in Charles St and his wife lived in Salters Alley. Not sure why they were married in Shadwell when he had been baptised in St George in the East? I love the old maps, they provide such an interesting insight into the history of a place! And these blogs also provide an interesting contrast between past and present! PS. Sydney has such a short history (but a beautiful Harbour)!